Crown yourself this St. Patrick's Day with your own handmade clover crown that you can make out of green crepe paper, pipe cleaners and a few other basic crafting supplies. Learn how to create a custom label for your favorite brew and other festive ways to dress up your drinks. Package up small treat bags of gold wrapped candy or chocolates such as Rolo, Ferrero Rocher or chocolate gold coins by making your own St. Patrick's Day treat bag by printing the horseshoe bag template on pieces of vellum paper to make your own mini bags. Proudly display your Irish heritage with a stylish homemade leather shamrock key chain that you can make in under 10 minutes. Make your friend smile this St. Patrick's Day by surprising them when they find a handmade card from you that says you are super lucky to know them. A dollop of frosting and gold-hued sugar transform store-bought caramel candies into teeny pots of gold. Nothing says it is time to celebrate like balloons, and you can easily take regular green balloons and make them look like lucky four-leaf shamrocks with this great DIY. After you are finished baking your delicious St. Patrick's day cake decorate the top of the cake with a mini clover patch by crafting mini clover cake toppers using green cardstock and toothpicks. Take your St. Paddy's bash to the next level with these festive (and delicious!) Jello shots. Do you celebrate St. Patrick's Day by going out to see the local St. Patrick's Day parade? If so get ready to cheer on everyone in the parade this year with your family by making several bright green paper shamrock fans to wave as the parade moves past you. Pour your green beer or other St. Patrick's Day themed drinks in some festive glassware by downloading the shamrock template that you can use with your Silhouette machine to cut adhesive vinyl so you stick onto regular drinking glasses. Add something green to your outfit for St. Patrick's Day with this simple to make a polymer clay clover necklace that is easy enough for those of you who have never made jewelry before. Need the perfect outfit to wear with your friends for drinking green beer at your local Irish pub? If so, you can make a spectacular sequin shamrock shirt that you will want to wear every St. Patrick's Day. Surprise your friend this St. Patrick's Day with a cheerful rainbow card to wish them luck. This super cute printable card is complete with gold confetti at the end of the rainbow making it extra fun! Decorate your fireplace mantel by adding a festive artwork this March by painting a chevron pattern or two shades of green on a small canvas and adding the words you are my pot of gold using white vinyl for some inexpensive art perfect for St. Patrick's Day. Add some curb appeal to your home by hanging this lovely DIY shamrock wreath on your front door this March. One nifty feature of the design is it is designed to be interchangeable so you can easily remove the shamrocks after St. Patrick's Day is over and replace them with new decorative items such as flowers for spring. With St. Patrick's Day just a few days away it is time to start decorating your home for your St. Patrick's Day party and these DIY shamrock balloons which are covered in shamrock stickers are a super easy way to bring the luck of the Irish to your home. If you are someone who prefers a more Scandinavian look in your home with muted earthy tones and minimal design you can skip the bright green this St. Patrick's Day and decorate your home with a DIY modern looking balsa wood shamrock garland. After your St. Patrick's Day party has ended send your guests home with their own pot of gold by making them shamrock party favors that you can personalize with their names and fill with gold covered chocolates. This party favors would also make a great way to indicate guests where to sit at a dinner party by placing one shamrock in the center of the place so guests can find their seat by reading the shamrocks. Inspired by the popular kiss me I'm Irish phrase that is used at St. Patrick's Day this printable black and white banner with gold detailing would be a chic addition to your home this March. Practice your crochet skills with this simple shamrock pattern that you can use to make small shamrocks out of yarn for your home. Let's get stitchy! This super-cute embroidery pattern features popular St. Paddy's Day motifs like shamrocks and a pot of gold. Either hand draw on your own chalkboard or get the printable chalkboard quote to make a festive St. Patrick's Day vignette in your home. Is it possible to trap a leprechaun? With some paper, glitter and a little bit of imagination, you and your kids can find out! 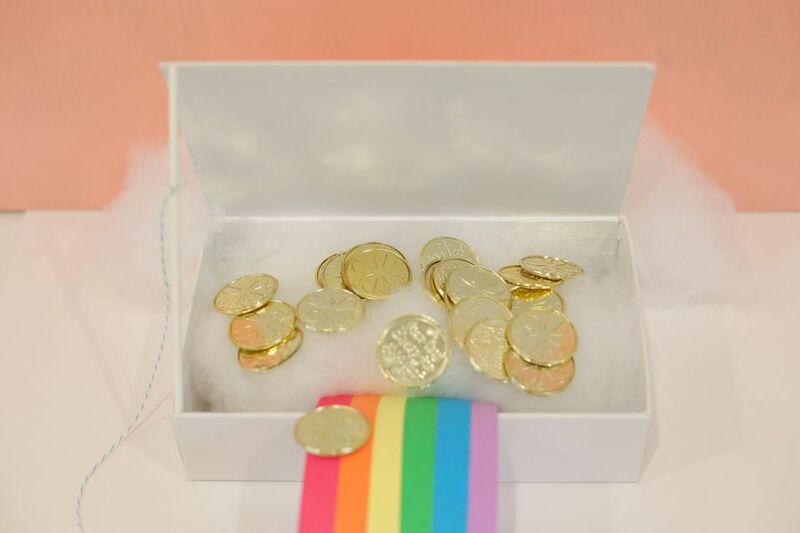 Get inspired these DIY leprechaun trap ideas. Swap out one of your old artworks this March for this beautiful Irish proverb print in Kelly green that says "may your troubles be less and your blessing be more and nothing but happiness come through your door". Decorate your homemade Bailey's cupcakes this St. Patrick's Day with some printable cupcake wrappers and cupcake toppers that you can make with a few sheets of paper and some toothpicks. For all you classy gentlemen and ladies, celebrate St. Patrick's Day by making a breathtaking and elegant shamrock and baby's breath floral crown using that you can wear while out celebrating with your friends. These white chocolate-dipped pretzels take just a few minutes to make. Enjoy the treats on their own or use them as edible cupcake toppers! Surprise your kids with their very own pot of gold this St. Patrick's Day by using black paper to create a pot box that can be filled with gold foil wrapped chocolates. Do you have a friend who is Irish or loves celebrating St. Patrick's Day? If so, assemble this adorable shamrock package that you can mail to them for St. Patrick's Day as an easy way to brighten their day. Convert an old large cardboard box into a large shamrock piñata with some tape and green tissue paper to make a fun activity for your family and friends to do together this St. Patrick's Day where they can take turns hitting the piñata until it breaks and all the gold foil wrapped chocolates fall out. Celebrate your Irish heritage by making a St. Patrick's Day a giant shamrock accent wall for your home out of triangle sheets of cardstock in shades of green and gold. End St. Patrick's Day by finding the pot of gold at the end of the rainbow by making a pot of gold cake complete with chocolate coins. This St. Patrick's Day, if you are Irish or wish to be for the day, go in to work a sophisticated work-appropriate handmade shamrock corsage that you can pin to your suit's lapel. Switch out one of your regular art prints this March for a St. Patrick's Day themed one that you can download and print from Paper Crush. The striped shamrock artwork comes in 6 variations of black, white, gold and green that work well for a modern St. Patrick's day decor. This rainbow sandwich may not lead to a pot of gold, but you're sure to treasure each bite. Using sheets of green felt cut out shamrocks to create a simple shamrock chain that you can use every year as a garland to decorate for St. Patrick's Day. Dance a jig and dress up this St. Patrick's Day by wearing a mini Leprechaun top hat that is made out of green and gold glitter cardstock. When you slice into this stunning green ombre cake this St. Patrick's Day everyone will marvel over the beautiful shades of layered green cake. Bundle up in a beautiful green and gold infinity shamrock scarf before you go out to a pub this St. Patrick's Day. You can easily make your own by out of 1 yard of green cotton jersey, a shamrock stencil, and gold metallic fabric paint. This DIY lucky sign is perfect for your fireplace mantel, and can easily be made by using paper mache letters, some craft paint, and all those extra pennies in your piggy bank. Get your St. Patrick's Day outfit ready by making your own kiss me I'm Irish shirt by using the free template and stenciling the design onto a plain t-shirt. Using green paper hearts create several 3D paper shamrocks in various sizes to decorate a wall or window this St. Patrick's Day. Celebrate the luck of the Irish by printing this mint green artwork that you can frame for your home! Accessorize your home for St. Patrick's Day by using fabric transfer ink to create a tea towel with shamrocks various beautiful shades of green. Homemade marshmallows + rainbow licorice = the cutest little rainbow treats ever! Decorate a potted plant by creating a mini lucky us banner to stick on either side of the plant as the perfect green centerpiece for your table this St. Patrick's Day. This fun lucky in love print by Lolly Jane can be downloaded for free and stuck on your wall using decorative washi tape. Let the kids help decorate your home for St. Patrick's Day with this cute 4-leaf clover that is made out of strips of green construction paper stapled together. Paint several lines of various shades of green, and label them with clever names such as Celtic chartreuse, shamrock green, and lucky leprechaun to create a green paint swatch artwork for your home this St. Patrick's Day. What could be a better way to start off your St. Patrick's Day than with a huge stack of pancakes topped with a cute printable top of the morning banner? To make your own breakfast banner print the free template from Alice & Lois and tape it onto a toothpick so that you can stick it into your flapjacks. Transform regular green mittens into these eye-catching gold clover mittens in minutes by ironing gold heat transfer vinyl. Paint the word lucky over a framed patterned piece of paper, such as wrapping paper, to make a quick St. Patrick's Day artwork for your home. Celebrate St. Patrick's Day by pouring yourself an Irish Coffee in a festive shamrock mug that you can make in minutes by using a marker to create dots around a shamrock sticker stuck in the center of any plain white or green mug. Dress up your front door by re-using your green Christmas wreath and adding a banner across the middle that says lucky to make it perfect for St. Patrick's Day. Encourage your child's creativity by letting them create their own stamped shamrock t-shirt that they can wear to school this St. Patrick's Day. If you are looking for a last-minute way to dress up for St. Patrick's Day this kiss me I'm Irish shamrock printable is the perfect solution as it can be worn as a corsage on your wrist, pinned on your shirt, or clipped into your hair. Prefer wine to beer? Decorate a bottle of wine for St. Patrick's Day with this festive printable label.